Allegation #2: It is alleged that in spring semesters between 2012 and 2015, the men’s basketball coaching staff impermissibly observed approximately 16 men’s basketball prospective student-athletes as they participated with men’s basketball student-athletes in activities detailed in allegation #1. Allegation #3: It is alleged that during the 2011-12 through 2015-16 academic years, Bob Semling did not demonstrate that he promoted an atmosphere for compliance within the men’s basketball program due to his personal involvement in the alleged violations. Allegation #4: It is alleged that between the 2011-12 academic year and the fall 2015, the scope and nature of the violations detailed in Allegations 1 and 2 demonstrate that the institution violated the principle of rules compliance when it failed to adequately monitor the men’s basketball program’s compliance with NCAA playing and practice seasons and tryout legislation. According to a report on the University’s athletic website, an internal investigation was launched in April in response to an NCAA request after an anonymous complaint accused the program of starting team practices before Oct. 15, the official start date set by NCAA rules. The University found what it called “minor” rules transgressions after it confirmed head coach Bob Semling and the coaching staff oversaw team practices before that date last fall. The men’s basketball program was also found to have limited access by the general student body to Quandt Fieldhouse. In addition to Semling’s suspension, the university imposed a ban on participation by the men’s basketball team in WIAC and NCAA postseason play for this season as a result of an ongoing NCAA investigation. UWSP also announced several self-imposed penalties, including the cancellation of the opening day of practice Oct. 15 and the loss of one additional practice day in each of the next two weeks. At a news conference on Thursday, UWSP Director of Athletics Brad Duckworth state, “As an institution, we feel that it is imperative to take swift and immediate action in response to what we have been informed by the NCAA are major allegations regarding our men’s basketball program. Semling has coached the Pointers since the 2005-06 season and holds a career record of 262-71. 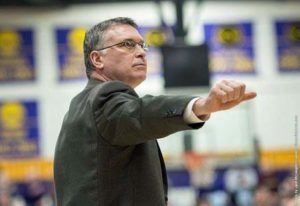 UWSP is 6-5 this season and will play at UW-La Crosse on Saturday at 5:00 p.m.
Current associate head coach Kent Dernbach will serve as interim head coach during Semling’s suspension.